We had a close race between Israeli and Turkish cuisine this quarter, with Israeli winning by one vote. However, the broader Levantine area encompasses both Israeli, parts of Turkey and many other countries in the region, so we will have plenty to explore! I look forward to discussing the flavors of this fascinating region with you all in the coming months! Thanks for your work organizing and keeping this project going and growing! Hopefully, we will not discuss whether houmous is an Israeli or Palestinian creation. Please. Levantine cuisine is the traditional cuisine of the Levant, known in Arabic as the Bilad al-Sham and Mashriq, which covers a large area of the Eastern Mediterranean. It continues to carry an influentially mainstream character in a majority of the dishes today. It is found in the modern states of Jordan, Lebanon, Israel, Palestine, Syria, and parts of southern Turkey near Adana, Gaziantep, and Antakya (the former Vilayet of Aleppo). In the broader family of Mediterranean cuisine, Cypriot cuisine also has strong Levantine influences. Conversely, some of the dishes listed below may have early origins in neighboring regions, but have long since become traditions in the Levant. What cookbooks or website do you recommend? Especially on Israeli ? I have a Lebanese cookbook in French - le vrai goût du Liban. On a broader sense Cypriot cuisine - I have 2 cookbooks, 1 in the same series - le vrai goût du Grèc and Phaildon’s Greece - the Cookbook. Well, a few Ottolenghi’s books - Jerusalem, Plenty and Plenty More. Hopefully, we will not discuss whether houmous is an Israeli or Palestinian creation. The broadest and probably therefore most useful is Roden’s “New Book of…” I also like “Zaitoun” but, to be blunt, that’s because of the author’s committed support for the Palestinian cause (a political issue which I share with her) and the way she writes about how the, erm, situation, impacts on food as it does on every other aspect of Palestinian life. You already have “Jerusalem”, so know that it brings together both the Jewish and Arab food of the city. I no longer have any Cypriot cookbooks so can’t make a recommendation but suggest that you might like to get one as the country’s cuisine differs from Greek. Whilst it obviosuly bases itself on Greek (as the majority population has Greek heritage), it also draws in the food of the minority Turkish population. And then has influences from east towards Lebanon & Syria. So, if you eat a mezze meal in a Cypriot taverna , it will feel quite different from a similar meal. in a Greek taverna. Writing has made me hungry for Cyprus - it’s a country we visit fairly often and Mrs H lived there for a number of years as a child (her younger brother was born there). We’d planned to visit last autumn as a present to myself after the cancer treatment but the hospital advised against travel. Maybe later this year. Maybe. Although the mixing of sweet and savoury is not uncommon. I quite like making a dip from tahini and adding enough date syrup to sweeten it (but not cloyingly so. Although the mixing of sweet and savoury is not uncommon. I like sweet and savory together too, but chocolate and mint in hummus crosses the line for me, in a very bad way! 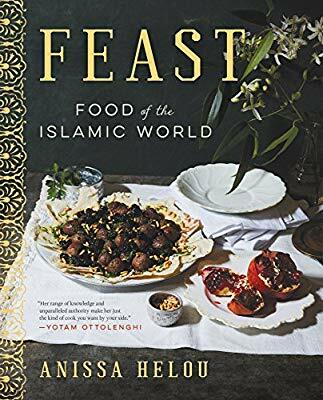 This book Feast - Food of the Islamic World is highly recommend, written by Anissa Helou, for anybody who likes cooking big meals. I’d like to try some newer-to-me dishes, so I look forward to seeing what others choose to make. I also just got Gaza Kitchen from the library after @ChristinaM(?) mentioned it on WFD. I see it’s on @Harters list too - recommendations please! I borrowed this from the library and it took ages, but I wasn’t that inspired when I finally got it. I did copy a fava bean salad recipe, though, which I’m hoping to make in the next week. Are there any recipes you’ve particularly enjoyed from it, @naf? Frankly, it will not survive our next book cull. It’s written in American English and I simply don’t like reading recipes that measure in “cups”. My other issue, presumably related, is that recipes use beef when it will be clear to anyone who knows about Eastern Mediteranean cuisine that lamb (or goat), not beef, is the meat used in that part of the world. It makes me wonder what other ingredients have been adapted for North Americans and, therefore, just how authentic are the recipes. It should be a useful book. Helou knows her stuff. I no longer have any of her books but she used to be the person who would appear on TV in the UK over almost any Middle Eastern food subject. I have a vague recollection that she did a TV series about Lebanese cooking. Hmm. I guess I’m more inclined to be flexible on the topic of authenticity and adapting to ingredients available, if it tastes right in the end. Otherwise I’d drive myself crazy every time I looked at an “Indian” recipe (including those by Madhur Jaffrey and Meera Sodha, and breezing right past every other non-Indian-disaporic author who has published a “curry” recipe ). Thanks - it was the kofte that I recall you mentioning! Me too. Even when it’s something from my own culture - like, say, Lancashire Hotpot. That’s a dish Mum used to make regularly and we make now & again. But I’ve also eaten restaurant versions, including a Michelin starred version, which are very, very different from Mum’s. I really couldnt tell you which is the most authentic - and I never fuss about authenticity in restaurant food (as I rarely have a clue as to what is “authentic”). But what all those hotpots have in common is the use of lamb. Make it with beef and it’s become beef stew, not Lancashire Hotpot. This is not appealing to me on any level. Even if trapped in my car in the snow it would take me days to be tempted. So… I don’t know about the Levantine region, but Muslim meat dishes in India (which largely originated in the Middle East and came over with the conquerers) often have a beef and a goat (and even sometimes a chicken) equivalent. Reasons: availability, relative price (this is a surprisingly significant factor - beef/buffalo is much cheaper), and as a nod to other observances (religious , and also “newer” meat eating palates - ie vegetarians will often switch with chicken first). Lamb is still an infrequent (and usually more expensive) meat choice in the US, so I’m not surprised an immigrant to the US would have adapted lamb recipes to beef. Not any more than I’d react to Indian goat recipes being switched to lamb (it took me years to be able to tolerate the gaminess - I vastly preferred beef or chicken as a substitute until milder New Zealand and Australian lamb became available). I mean, we wouldn’t dismiss Madhur Jaffrey just because she wrote a vindaloo recipe that not only substituted chicken for pork, but also used yogurt , right? !